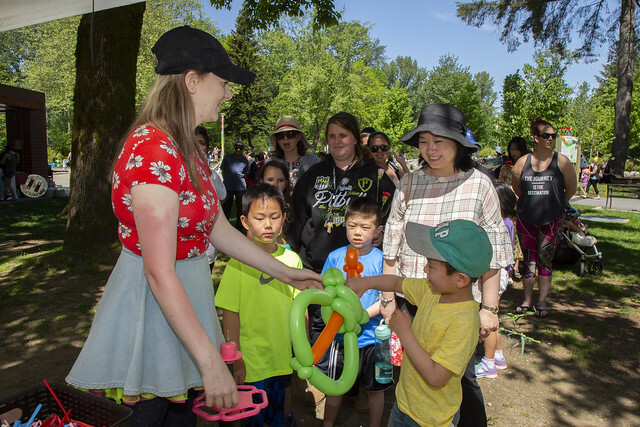 Mark your calendar for May 3 to 11, 2019, when Port Coquitlam celebrates its 96th annual May Days with nine days of free family activities, local culture, live entertainment and more. Dating back to 1923, May Days is Port Coquitlam’s annual spring festival and one of its signature events. One of the main highlights is the Rotary May Day Parade (this year on May 11) followed by an afternoon of entertainment and activities in Leigh Square. Maypole dancing by local children, dance performances and the presentation of the 2019 May Day Royal Party. Springtime in PoCo theme, featuring new original artwork on various subjects, in oil, watercolour, acrylic, mixed media, and photography. One of the biggest in Metro Vancouver, with marching bands, floats, and many laughs. Road closures start at 9 am. This year we are celebrating the 96thAnniversary of Port Coquitlam’s May Day Celebrations! We are extremely fortunate to have another team of dedicated volunteers lead this festival through the May Day Festival Roundtable to bring our community together for a jam-packed week of fun for the entire family. On behalf of City Council and our staff, we look forward to bringing everyone together once again to celebrate our PoCo pride! May Days officially kicks off with the Opening Ceremony on Friday, May 3 at 7:30 pm at the Port Coquitlam Recreation Complex featuring Maypole Dancing. This is one event you will want to bring the entire family out to enjoy. The festivities continue with Art Focus Artists’ Association’s annual Spring Show on May 3, 4 & 5 and the popular Rotary May Day Parade on May 11. Get your spot early to see the parade pre-show featuring the Vancouver Police Motorcycle Drill Team, known for their amazing formation! Come on out on Saturday, May 11 for a day of family fun beginning with a pancake breakfast from 8:00am – 11:00am at The Outlet at Leigh Square and bring your lawn chair and join our community as we line the streets of downtown Port Coquitlam to watch the vibrant parade floats and marching bands. Make sure you stick around for the Party in the Square to enjoy Biz Alley Market, entertainment, refreshments and our community spirit at its best. The participation of our residents, sponsors and volunteers are what make May Days so special. I’d like to give a special thank you to ourMay Day Committee members, the Port Coquitlam Centennial Rotary Club and our volunteers for the countless hours they put in and tothe Department of Canadian Heritage for their generous financial contribution.Thank you also to our sponsors Spraggs Law, The Royal Purple, Port Coquitlam Downtown Business Improvement Association and the Tri-City News. On behalf of City Council, we look forward to having you join us for our 96thMay Days Celebrations and be a part of history! Further details can be found on the City’s website, our Facebook page and in your local newspaper. Showcase your business at the May Day Festival! This is your opportunity to showcase your business and be part of this year’s Biz Alley Market! Join us on Saturday May 11, 2019 for the City of Port Coquitlam’s May Day Biz Alley Market located within the Party in the Square event, as part of the May Day Celebrations. The Rotary May Day Parade, starts at 11am at Atkins Rd. & moves northbound along Shaughnessy St. to Elgin Ave., eastbound on Elgin Ave. to Mary Hill Rd. & southbound on Mary Hill Rd. to Hawthorne Ave., then eastbound on Hawthorne Ave., with the dispersal being on Tyner St.
Leigh Square Place east of Shaughnessy St. from 7 am May 10 – 7 pm May 11. May 10 afternoon access to Leigh Square parking lots will be limited due to tent installations & set ups. Including the City Hall lot & the large parking lot between Wilson Ave. & the Elks Hall. Some parking lots will stay closed until Noon Sun May 12. Street parking will be available before & after the parade. Donald St. & the laneway behind Dairy Queen will be closed from 7 am- 7 pm Sat May 11. Shaughnessy (Pitt River to Atkins) Rindall, Central , Hawthorne, Welcher & Tyner Aves. will be closed for parade assembly & dispersal 9am -1pm with no on street parking 7 am – 1 pm, Sat May 11. Shaughnessy St. from Wilson Ave. to the Shaughnessy St. Underpass, Elgin Ave. & Mary Hill Rd. & Hawthorne to Tyner will be closed during the parade 10am – 1:30pm Sat May 11. The Coast Meridian Overpass & Maple Ave. are OPEN for traffic detouring as usual. The Rotary May Day Parade will be held Saturday May 11, 2019. Parade applications are being accepted online here. The month of May is believed to have been named for the Roman goddess of spring and growth, Maia. The month of May heralds the awakening and flourishing of nature and the coming of spring. In the City of Port Coquitlam, this month marks the celebration of May Day. In ancient times, May was a time for outdoor celebrations. In Rome, it was a time that was sacred to Flora, the goddess of flowers. The Romans celebrated May Day with flower-decked parades. In England, the village youth went to the woods to gather spring flowers and hawthorne branches, returning singing and dancing. The flowering boughs they gathered were used to decorate the May tree. As the white flowered hawthorne tree became the tree most often decorated, it came to be called the May tree. In more recent celebrations, the May pole, symbolic of the May tree it has replaced, has been decorated with colourful ribbons. The City of Port Coquitlam first introduced the celebration of May in 1916 when the principal of James Park School, Mrs. Enid Cox, arranged a small celebration for her pupils. The first official community May Day was held in 1923, when James Park and Central schools combined their efforts. It was in 1923 that Miss Evelyn Mars was crowned as Port Coquitlam’s first official May Queen. In today’s Port Coquitlam May Day celebration, a May Queen and an Ambassador, along with the Royal Party, preside over the festivities, which include a parade, music, entertainment and dancing around maypoles.